The caller ID system allows advanced users to change their ID number to any number they want. This is so people calling from companies, etc. can have their caller ID appear as the main company phone number, not the outgoing line the internal phone system choose. This has allowed hackers to spoof caller ID calls for a while. Now it’s an online service that even includes voice masking: SpoofCard.com. Try it out (you have to pay). This site will let you play pranks on your friends our issue threats to foreign leaders — I don’t recommend the latter. A year ago I called Walt Lastewka’s office and asked him to vote for gay marriage. The person working the phone assured me that St. Catharines was on the right of that issue. I’ll admit to not growing up in St. Catharines, but I thought that rights are for all couples. I thought this was Niagara not Alberta. He assured me this wasn’t the case. Walt Lastewka did not win by the same majority as last time because of the problems the Liberal party had: Gomery, etc. Walt Lastewka lost, while other Ontario Liberal MPs held their seats, because of that issue. The gay community alone could account for his loss, let alone civil and human rights voters such as myself. Canada now moves forward with another minority parliament. A parliament must serve all Canadians and it’s harder to do without representation from the majority of Canadians. The NDP and Jack Layton will be there to represent the rest of Canadians, especially as Mr. Martin steps down. I predict the left will be better represented under Stephen Harper than any other time in the last decade. That said, I’ve been wrong before, I thought Paul Martin would live up to his promise to Bono. I thank the two departing Liberals for their contribution to Canadian democracy – it’s far more than I’ve made. I hope (semi)retirement finds them in good health. I’ll put the soap box away for a while now. It looks like Monday will bring a conservative government because Liberal arrogance, inaction and corruption have caught up with it. Is this the greater of the two evils? Mr. Harper wants to remove gay rights, Mr. Martin runs for office on a leftist agenda and governs on the right (ie. a decade old day care promise!) The two major parties have given you no reason to vote for them. The Green party promises to be conservatives who conserve. If you think the Liberals are thieves not just because of Gomery but because they own property – vote for the Marxist Leninist party! If Stephen Harper’s promise to repeal gay marriage but honor current marriages isn’t enough for you, you also want them lynched, then vote for the Family Collation! The NDP – I will be voting for the NDP because we need them there to keep the conservatives in check. The Liberal party will need two years to get their house in order and their credibility back: Canadians want to see them punished. A strong NDP is what we need to keep the conservatives in check. I think the NDP represent progressive Canadians who look at the government America has and knows that we don’t want to be in that kind of situation – borne of a two party system. Linux. Stop reading now if that means nothing to you. 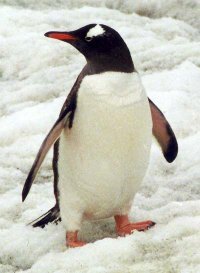 I’ve had enough with Gentoo Linux. I started running Linux at home with Red Hat 9 – often refered to as the Windows ME of Linux (by me). Just as I was getting into compiling my own code I installed an OS that has a wonky C library. So I went to the polar opposite – from the Enterprise penguin, in his tux, to the hacker penguin, Gentoo, the one dressed almost all in black. Gentoo borrows from BSD’s ports and has a simple interface to install software and update files and uses my favourite open source tool, rsync, to pull it all together. Plus it takes all that open source software, optimizes it for your system and complies it. Installing software is simple, it takes time, but the ease of use and optimization is worth it. The problem is that Gentoo developers keep releasing buggy code. This isn’t the first time something like this has happened with my Gentoo installation. Previously deleting the ebuilds, re-syncing the portage tree, de-tuning the optimization had fixed other similar problems. This time nothing fixed it. So I’m done with Gentoo, I’m working on updating my 600Gig server shortly. Red Hat has got their act together again with the Fedora project – and they’ve put version 9 far behind them. St. Catharine’s 4th Street Tim Horton’s is being gutted so in the interim they’ve wheeled in a Tim Horton’s trailer. It serves as a drive thru and a walk in. I wonder how many there are and how much action they see. Too bad the license plate is covered by the steps. Here’s the above picture larger and another angle. You are currently browsing the iMatt :: The Blog of Matt Clare weblog archives for January, 2006 .